We are seeing an uptick in orders for Custom Strobel Rambler® Travel Basses, and recently built a left- handed version for Simon from Tasmania, please check out our Bass Gallery for more pics. 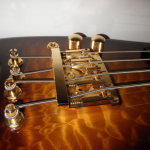 Simon went all out when designing the Bass Guitar of his dreams – ordering all Gold hardware including the Schaller D4 Roller Bridge and the custom made Schaller M4 2000 tuners. 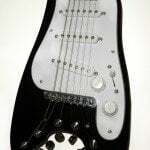 The pickup is a Schaller PBX P-bass model, which unfortunately is no longer available from Schaller (we do have a few left in our stock). 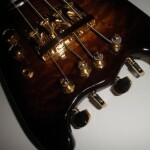 Simon also ordered a AAA Quilted Maple top on a Mahogany body, and went with an Ebony fretboard on a Maple neck. We wanted a light Tobacco Sunburst to show off the beautiful grain of the top. Brown and Red colors go best with a Mahogany body, while Ash or Popular look good with Blue or Green finishes. 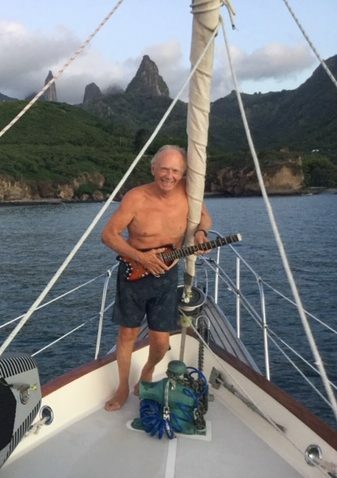 We have modified several Rambler® Classic Travel Guitars for left handed players by turning around the nut and the bridge and relocating the strap buttons. 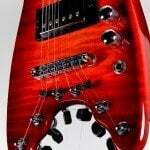 This works OK, as the Rambler® is relatively symmetrical, but the controls and the jack end up on top of the guitar. 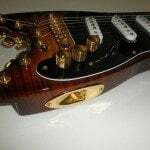 Making a truly left handed instrument involves modifying the templates and paying close attention to drilling holes and routing pick up cavities to make sure they line up properly. We fabricated a special custom nut made from camel bone for Simon’s bass. 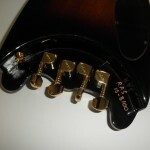 The tuners have to be installed with the flat surface towards the outside of the guitar. 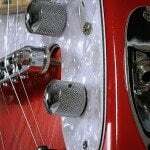 The strings are routed to the tuners from the center of the neck so the angle of the strings line up with the holes in the D4 bridge. 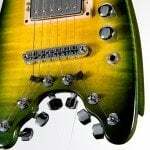 Consequently, the tuners tighten the strings the same direction as a right handed bass or guitar. The Rambler® Bass scale length is derived from a standard 34” scale by placing the nut at the 3rd fret. The string spacing feels correct since it matches a standard bass, but the overall scale length is 28-1/2”. The Rambler® Custom Bass is also available as a fretless model. Find out more about the Strobel Rambler® Professional Electric Travel Bass at our on our Rambler® Travel Bass Page. 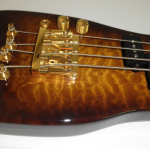 And see more Rambler® Custom Basses in our Bass Gallery. P.S. 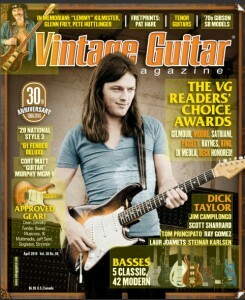 Please check out our Strobel Rambler® Bass in the April Issue of Vintage Guitar Magazine in the article “42 Modern Basses”! We are number 14 on page 99.